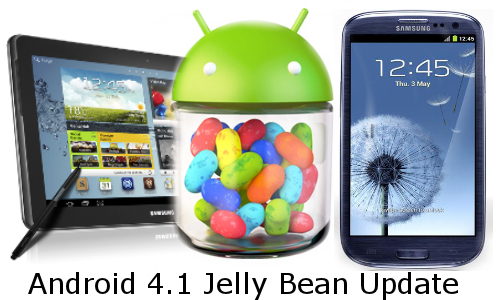 Not long ago we heard unconfirmed rumors about a few Samsung devices including the Galaxy S2 and the Galaxy Note 10.1 to receive the Jelly Bean update. Well those rumors have now been confirmed by Samsung at the recently concluded IFA, 2012 event in Berlin, Germany. Both the aforementioned devices are getting ready to receive the Jelly Bean update pretty soon after a few touches have been finalized. Even though Samsung did not disclose the actual dates as to when exactly the Galaxy S2 and the Galaxy Note 10.1 would receive the much awaited updates we are more then certain its going to be in the next couple of months. Samsung further added that the international version of the Galaxy S3 would be receiving the official OTA Jelly Bean update on September 3rd so by the time you all are reading this post, you probably must have already received and installed it. Since its an OTA update, you don’t have to use the Kies software on your computer to receive the update. We can’t wait to see what goodies Samsung has in store for TouchWiz on Jelly Bean, whether it will be the same experience as on the Note II, or something different. Those of you who have already received the update can feel free to share their views with us. Samsung still remains on top even after all the "Gloom and Doom"